I never dreamed that I would get this far around the world. I didn’t even know where the British Virgin Islands were until I was told that that was where we were going on the boat. But here I am. Stuck. But what a place to be stuck. My VISA credit card has arrived thankfully – I had to get a replacement sent to me because I lost the old one. So now begins the search for a ride up to Florida on a yacht. The only catch is that this is “the wrong time of year” for boats going up to the US from the BVIs. So it looks as though I might be here for a little while. Which as I said, is no bad thing. 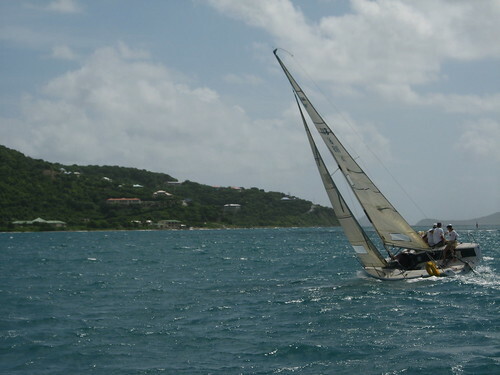 The highlight so far of being in the BVIs was the Virgin’s Cup Sailing Regatta. After hearing that some boats may be looking for crew for the race, I headed down to the Royal BVI Yacht Club and let people know that I wanted to be on a racing yacht. The sailing community here is very welcoming, and in the end Bill Bailey, a well known tactician and expert skipper agreed to take me on board. The Virgin’s Cup is a race where the person at the wheel of the boat – the helmsperson – has to be a woman. 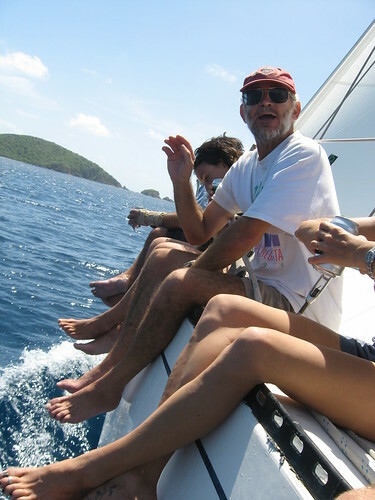 The race was from Tortola to Norman Island, and took about 2 hours. I was a winch tailer for the race, which meant that it was my job to pull in the loose ropes from the front sail each time we tacked to change direction. It can be a tough job pulling in rope when the boat is suddenly pitching from one side to the other. Unlike three years ago, when Bill Bailey’s boat won the regatta, we didn’t manage to get a podium finish. I enjoyed it thorougly however, and I hope there is another race I can take part in before I head up to the US. Glad to hear that your visa card arrived safely. Without looking at a map I couldn't say where the British Virgins Islands are either! Enjoyed the news article, though am a bit puzzled about the "College in England" – perhaps the mention 'Canterbury Uni' made the reporter think of England instead of New Zealand! Yeah Rob!I'm very glad your fine. I totally hadn't known about the British Virgins Islands.That's why there are deep values in your trip and message.You could tell us about a new world.I love that.I wanna say 'Thanks Rob!' always.ANW I know 'Canterbury Uni’is great one in NEW ZEALAND!! Oooooooo, I gots a famous cousin!!! Well, your brother (and I could guess which one!) can't say your emails are boring NOW can he!!!! I've just looked at the newspaper article – very interesting. I guess the reporter knows nothing about NZ so to him Canterbury University would naturally be in England! Saying you went to Canterbury University in Christchurch wouldn't have helped much either, unless you had added 'New Zealand'. I'm glad to read that it's all still ticking along nicely, I've been busy at work and was just wondering how your getting along. I see all is well and appears to be coming up roses… While sailing looks all nice I'm still not convinced about it. Don't think it'll catch on, cos your stuck to where the water is. Atleast with walking, cycling, driving a car and even riding a horse you can go in land and see more stuff. Or am I missing the point of sailing? Hope the trip continues to go well and look forward to the next post. i arrived in florida yesterday. you have a place in st. augustine if you head north up the east coast of the state. i think julien is still in miami, in case you didn't already know. As sea journey is a slow one while you are hovering on the water and island hopping I have travelled to Eastern Europe. I started off at my mates' place in Leuven then to Köln, Berlin, Leipzig, Plzen, Český Krumlov, České Budějovice, Tabor, Praha, Olomouc, Kraków, Lvov, Kiev, Odesa, Chişinău, Braşov, Bucharest and then time ran out so i flew back to Belgium. I am heading back to Belgium to live and work from 09 Dec. Just had too much sun here in OZ. I think you'd be interested to read about the fact that not everyone endures a great distance and faul weather to discover the world but there are also people with other reasons to do so. glad to read that you are still one piece. come back… i'm bored already. Glad the visa stuff is sorted – isn't international communication amazing! Teaching in Melbourne 2008 has fallen through (really low enrolments so they've canned the course) so I'm hoping to get to Kenya a lot earlier than 2009 now! Will be in NZ at least till Feb though. Looking forward to seeing how things unfold. where are you bubba? it's boring here no updates, no pictures, no nuffing are you at disney world?…hiding out? It has been a busy busy few months my end mate, have just got round to checking the site and WOW! I take it you spent only a short while in the UK…prob best considering the weather! So you are gonna head across the states on your board? Your trip continues to amaze mate. Bet Beppu seems a lifetime away now huh. Hope you haven't sunk and have had to swim to Florida – or use your board as a raft. Interesting thought. Not sure what you'd do with the pack though. Hope you're cooking up a treat on someone's boat. When you were in the middle of nowhere (in the old …..stan countries) you were able to update almost every day. Although we keep checking the blog each day we keep getting disappointed….. I really hope things are okay for you and that you are actually on a wonderful cruise ship having the time of your life and not lying at the bottom of the ocean with an anchor attached to your leg! Really looking forward to hearing about more of your exciting adventures soon. We are off to NZ for 3 months next year which is about as exciting as our life gets at the moment! Glad you're back online, updating photos on Flickr today ! Mass Reply: Thank you all for your concern. It has been an eventful few weeks. Details to come in the future.